Previously, as Finance Director, Neil has led a number of strategic projects for the business. 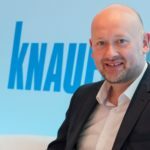 Neil originally joined Knauf Insulation in 2006 as Head of Commercial Finance, before becoming Finance Director in 2011. Prior to joining Knauf Insulation, he trained as a Chartered Accountant with KPMG. He takes over from John Sinfield, who is leaving to pursue a new opportunity outside the company. Knauf Insulation is a leading provider of high-performance, non-combustible Glass and Rock Mineral Wool insulation solutions.